On my last Kelowna trip, I didn’t have time to do winery tour. Five years ago, me, my family from Indonesia, and my-now-husband were in Kelowna visiting some of the well known wineries. So, I decided to make a post about my Kelowna winery tour experience to you all 🙂 I know that some of the pictures maybe out dated. Nevertheless, the number of wineries in Okanagan Valley keeps growing every year. As I’m working in wine industry, I have a chance to have basic knowledge about wine and have an opportunity to taste a lot of different varieties. I must say that BC wine has become more popular than its competitor from California and other countries. Okanagan Wines provides easy to browse list for all the wineries around Okanagan Valley area. WineBC provides greater list of the wineries available in British Columbia. Or if you don’t want the hassle arranging your own tour, you can join one of these Wine Tours that will guide you through certain wineries while enjoying some glasses of good BC wine. If you have the freedom to explore the winery by yourself, there are 5 areas around Kelowna itself according to Kelowna Wine Trails guide. They are known as Westside Wine Trail, Lakeshore Wine Route (South of Kelowna), Downtown Kelowna, Kelowna Fab Five (East of Kelowna), and Lake Country (North of Kelowna). You can also explore more wineries in Summerland, Naramata, and Penticton (south of Kelowna) and even more wineries in Oliver and Osoyoos that is near Canada-USA border. 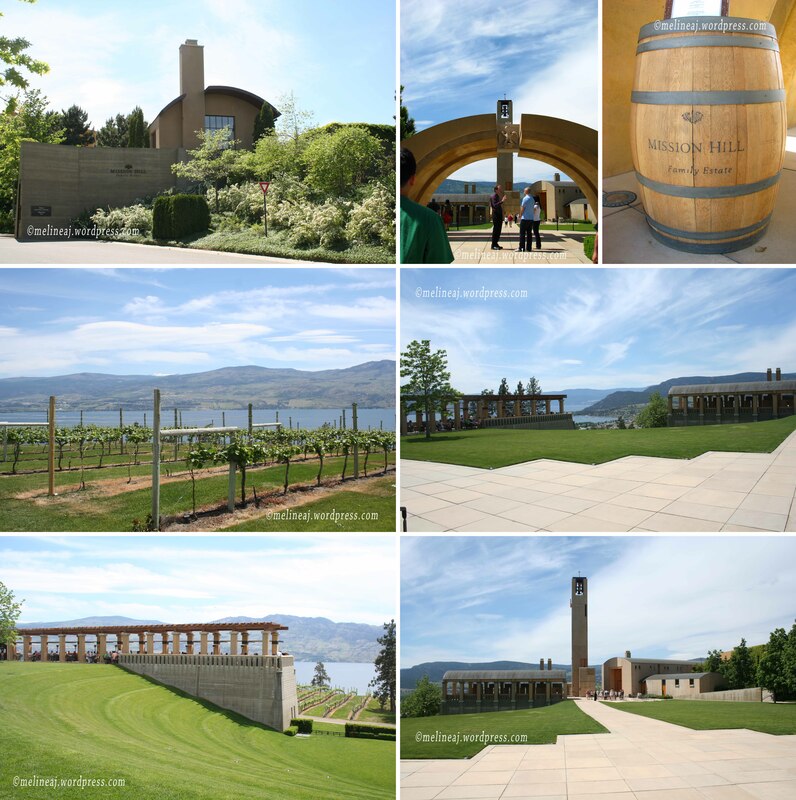 For this entry, I will focus on the winery around Kelowna that we visited. It takes about 4 hours drive from Vancouver to Kelowna. The drive wasn’t too bad since halfway to Kelowna, you’ll see beautiful Rocky mountain surrounding the area as well as some gorgeous lakes. If you prefer to get here fast for a weekend gateway, you can fly to Kelowna International airport (YLW) that is not too far from Downtown Kelowna (20 minutes drive). The Mission Hill Family Estate Winery is so far the most scenic winery I’ve ever visited. Established in 1996, Mission Hill wines have gained popularity in Canada and worldwide. There are two in-house winery tours available: Heritage Tour ($12) and Discovery Tour ($22). Both tours are 60 minutes each and will have a wine tasting & food pairing at the end (ref). In addition, there are three longer sommelier guided tours: Legacy Tasting Experience (90 mins for $55), A Vineyard Lunch & Tour (2 hours for $95), and The Connoisseur (75 minutes for $50). All charges are based on adult price. It is recommended to book the tour online beforehand as limited time and space are available – click here for the website. If you just simply want a wine tasting, go to the wine boutique. For $8, you will be able to taste some of their delicious wines. On the west side of the winery ground, there is the Terrace Restaurant with beautiful background of Okanagan Lake. Again, reservation is recommended as the space filled up pretty fast during lunch and dinner (website). Aside from their great wine, I absolutely love the architecture around the ground. Tom Kundig, the architect, did a great job on creating a detailed yet beautiful design (ref). From the entry gate, the keystone, the courtyard, the terrace, the bell tower, the loggia, and the amphitheatre (ref), I felt like I’m walking into an European village.